Welcome to the roommate chore section here at DIY Landlord Forms. If you’re welcoming new roommates to your property, then it is important to have both a roommate agreement as well as a roommate chore schedule. Do You Have A Legally Binding Roommate Agreement? Roommate agreements are extremely important – even if you are sharing the place with your friends. Trust me – there WILL be problems. Sometimes it will be something as simple as the roommate being late on bills. Other times it could be something more serious like your roommate bringing pets on the property when not allowed, or leaving the premises without giving advance notice. You can protect yourself by creating a roommate agreement. You can create one very easy with our roommate agreement form. This roommate agreement contract will protect you in case of any problems with your roommates. It’s also good for laying out the ground rules, such as living arrangements or duties that are to be performed by the roommates. But what about chores? Well – it’s always good to share the roommate chores, and having them in writing really helps. We’ve had a lot of experience with roommate chores and problems – both with our personal experience, and from listening to tenants or our friends. Always have a Roommate Chore Schedule. 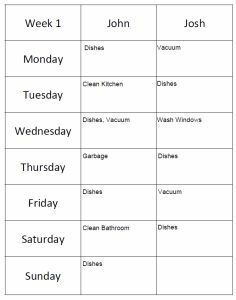 We’ve created Roommate Chore Schedules here and have made them as easy as possible for you to use. We currently offer roommate chore task lists for up to 4 separate roommates. All of our documents come in a blank format, with just the days of the weeks filled in. We offer them in both PDF and .DOC format. You can either print out the roommate chart blank template, OR you can use Adobe Acrobat or your favourite word processor such as Microsoft Word, to fill in the roommate chart THEN print it out. Unfortunately you’ll still have to buy your own fridge magnet to hang this up! 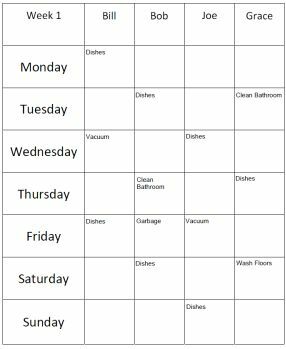 Here are all of the roommate chore charts that we currently offer. If you have any suggestions for additional roommate chart wheels or schedules then please e-mail us and let us know the details. Thanks. The only hardcoded data in the form is the days of the week. The rest we filled out ourselves. All of our files are editable via computer, and also provided in a blank template so you can print it out and write it in if you would prefer. And remember – having a roommate chore schedule is only the beginning. As someone with experience with roommates trust me on this – get yourself a roommate agreement. As you can see – it is easy to input and set up the roommate schedule, and it is set up to allow a lot of text just in case you have a lot of roommate chores! If you are sharing your house with three other people then trust me – you NEED a chore schedule otherwise it is going to be a mess. 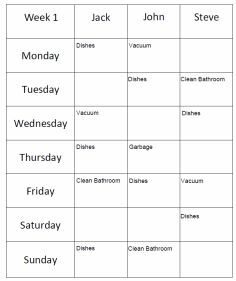 So be sure to go over this roommate schedule with your roommates and really break everything down, then hang it on the fridge afterwards. One additional note – as these are digital formats, we recommend doing it up on the computer at some point and e-mailing the roommate chart to your roommates. Now before you head off to bicker with your roommates over who does what – get yourself a roommate agreement form to make things even easier!